Nesaquake Middle School in the Smithtown Central School District is doing its part to help fight the battle against childhood cancer. In recognition of Childhood Cancer Awareness month in September, the school participated in a number of fundraising and awareness efforts. To kick off the fundraising efforts, the middle school’s sports teams “laced up” to fight cancer, sporting gold laces during their athletic functions. On Sept. 28, students, faculty and staff were encouraged to “Go Gold,” dressing in the color and purchasing gold hearts that were hung throughout the building. Later that evening, the fundraising continued at the school’s street fair. Nesaquake seventh-grader Sarah Schrier spearheaded the school’s effort as part of her Girl Scout project. Schrier also has some fellow classmates who were affected by the disease and wanted to raise awareness to support the cause. All of the school’s efforts tie into the district’s goals of social-emotional learning, empathy and citizenship. The school’s Parent-Teacher Association was also selling hearts as part of a districtwide effort to “whip pediatric cancer.” In total, the school raised approximately $400 for the cause. 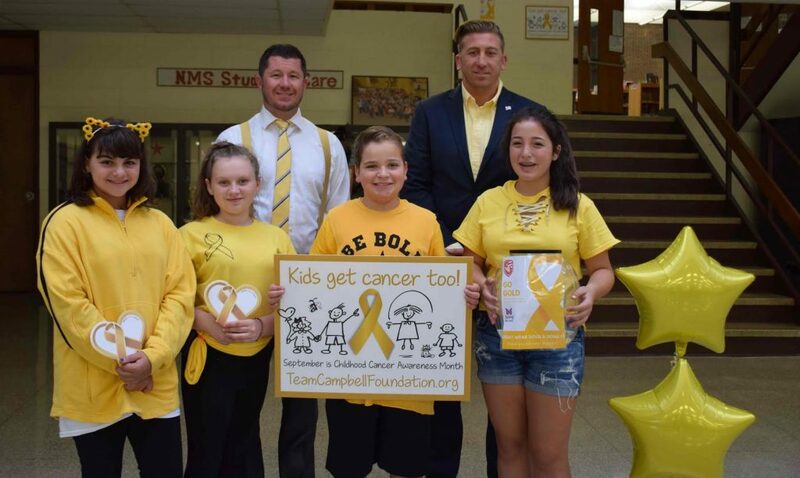 Photo caption: Nesaquake Middle School in the Smithtown Central School District helped raised money to fight childhood cancer by going gold on Sept. 28. Students are pictured with Assistant Principal Matthew Furey (left) and Principal Daniel McCabe.